According to the National Student Clearinghouse Research Center report, High School Benchmarks 2018: National College Progression Rates, which was released today, only 30 percent of students who graduated from high minority high schools in 2011 completed a college degree within six years, compared to 48 percent from low minority schools. Furthermore, only one in 10 students from high minority high schools completed a science, technology, engineering, or math (STEM) degree within six years, compared to 16 percent of students from low minority schools. The Benchmarks 2018 report provides high schools and school districts the most relevant benchmarks for evaluating and monitoring progress in assisting students to make the transition from high school to college. 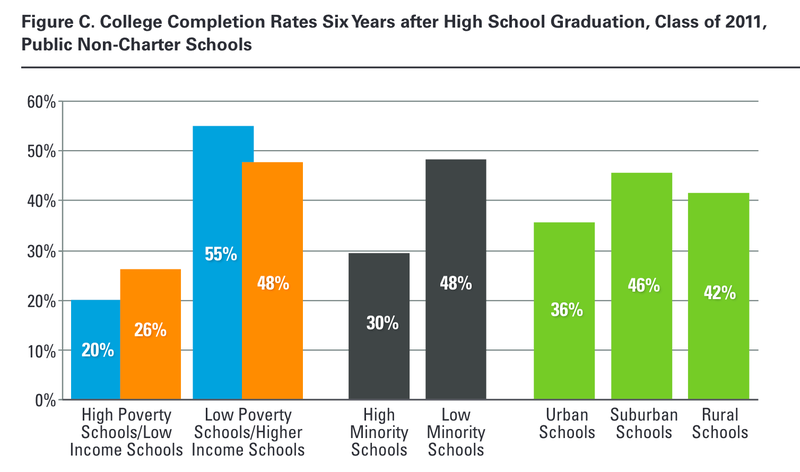 The sixth annual report provides the most updated data on high school graduates’ college access, persistence, and completion outcomes. The report covers public and private high schools from all 50 states and a majority of the 100 largest districts in the United States, including nearly 40 percent of all public high school graduates. The report presents a range of postsecondary outcomes for five high school graduating classes. This includes immediate college enrollment rates, persistence rates and six-year college completion rates, as well as enrollments and completions in various majors, including STEM and others. The High School Benchmarks 2018 report data are drawn from the Clearinghouse’s StudentTracker® for High Schools service, and are presented for students from different types of high schools, such as low- versus higher-income, and low versus high minority. This enables more focused discussions, particularly about low-income and minority students traditionally not well served by higher education. Figure C presents the rates of college completion as a percentage of all students in the high school graduating class, not just those who enrolled in college.